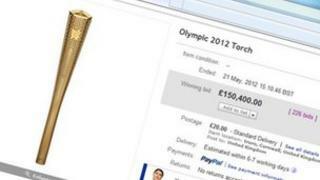 An internet auction bid of more than £150,000 for an Olympic torch was a hoax, the seller has said. Cornwall torchbearer Sophia Cowburn put the torch on sale on eBay to raise funds for the Invictus Trust charity. It attracted a top bid of £150,400. Ms Cowburn, 19, said: "The bidding closed and then a few moments after we found out it was a hoax bidder." The auction attracted 226 bids but the winning buyer has not been contactable for comment. Despite the winning bid being withdrawn, Ms Cowburn said others parties had expressed an interest. She said: "We're currently in the procedures of going back through the other bidders to see who's real and if anybody does want to make that kind of vast donation. "We had lots of people asking if they could buy it for a set price. "We'll look into if any of these are serious, or if a private buyer is interested. We're open to that." The Invictus Trust was founded by Ms Cowburn after her twin brother, Ben, killed himself after battling depression. It offers support to teenagers who are suffering from poor mental health and associated issues. Ms Cowburn was nominated to be a torchbearer because of her work in founding the organisation.